Black start is the first step in the process of system restoration in the unlikely event of an island-wide black-out. Black start can only be carried out by a generating station that can self-start without requiring power from the grid. We need to have this service available in both islands so we could re-energise the power system, and allow other generation to connect, following such an event. We may enter into black start contracts with parties who can offer the black start service compliant with our technical requirements and the Code. 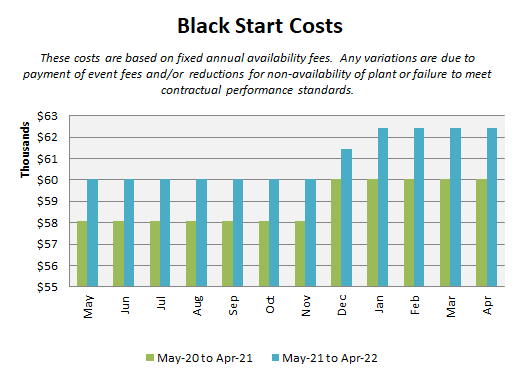 Black start is procured on a firm quantity procurement basis (via a monthly availability fee and/or a single event fee for specified stations). Black start costs are allocated to Transpower as the Grid Owner (see clause 8.56 in the Code for details). For the year to 31 March 2019, the costs for the procurement of black start services were approximately $660,000. We currently procure two black start stations in each island.